1. General construction quality is solid but definitely a notch below Leica. 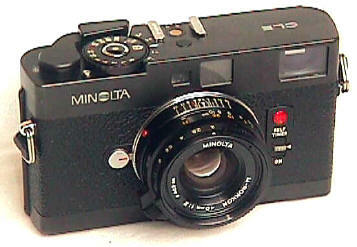 Basically the Minolta is a Toyota to Leica's Mercedes. It's a great reliable car, but it ain't a Mercedes. For example, the ISO knob is plastic, as is the film lead sprocket, and there is an awkward self-timer bulb marring the front grill. The reliance on batteries also worries me, since any tool with plastic or batteries will break eventually. I'd give this body three years max of heavy use before wearing down. If it lasts that long I'll be very happy. 2. After using a .72 M6 for 7 years, the .58 magnification viewfinder has required a visual adjustment. I keep putting my eye to the camera and thinking the scene can't possibly be that small. How dies it all fit into the framelines? It's so bright and wide! But after getting used to it, it's pretty sweet. Not only can I see the precise edges of my 40 mm lens for the first time, there is plenty of room around them to see what's just outside the frame. I guess that's no biggie to most rangefinder users, but I feel I've entered a brave new world. 3. The film advance knob is smooth as silk, and springs back into place after each shot. The shutter button's sensitivity is perfect. And with aperture priority, shooting requires less hands-on intervention than before. I feel like I've checked into a luxury hotel, the kind where bellhops carry your luggage and a concierge arranges your taxi. Did I really do all that stuff for myself before? What was I thinking? 4. The camera is noticeably lighter and smaller than my M6. It feels like a cross between an M6 and a Diana. I think it might be too light, actually. I prefer the stability of a heavy camera for slower shutter speeds, and for twirling aimlessly near my waist between shots. With 40 mm lens, the smaller CLE fits easy into any pocket. 5. Rewind is smooth and easy. And changing a roll of film is much simpler than with the M6. That's not much of a bragging point but it only constrasts how ridiculous Leica's film changing mechanism is. On the other hand, I used to enjoy putting the bottom plate in my mouth and watching people react as I meditated during the roll change. It took me about 30 seconds with the Leica. With the Minolta it's more like fifteen. 6. The M6 generated fairly regular comments from passersby. What's that camera? It's a Leica? How old? Do you process your film? Bla bla bla yada yada chit chat. I've gone a week with the small, black, unobtrusive CLE. Zero comments! I can do my thing and no one bothers me. I look like a tourist. Maybe I am one. 7. Slightly wider gap between frames makes cutting negs easier. Even with the wider gaps I can fit 38 shots on roll, since the sprocket only takes up a short film lead upon loading. 8. The camera body has a few odd protrusions: the rewind mechanism and battery case on the bottom plate, and a compartment in the back for cardboard film-type reminder. I expect these to create a bit of wind-drag when I approach the sound barrier, but it hasn't been an issue so far. I've joined the CLE club after realising that the 0.72 finder on the M6 is not good for 28mm and that I'm not a big fan of external finders...so I've got a CLE from a friend and I can relate with everything you say about it. I'd add that the shutter is a bit louder than the M6 (mine, at least). Good luck and have fun! I come to B for hard hitting journalism on the distance between frames on niche 35mm cameras, thanks for never disappointing. Come to B with no expectations. Then disappointment is impossible.